class="post-template-default single single-post postid-337179 single-format-standard custom-background group-blog masthead-fixed full-width singular wpb-js-composer js-comp-ver-5.7 vc_responsive"
Kearney, Neb. — The Niobrara River Basin Alliance (NRBA), the Nebraska Game and Parks Commission (NGPC), and the Nebraska Public Power District (NPPD) took a significant step forward today towards protecting the Niobrara River Basin, water flows and all users of the river now and in the future. 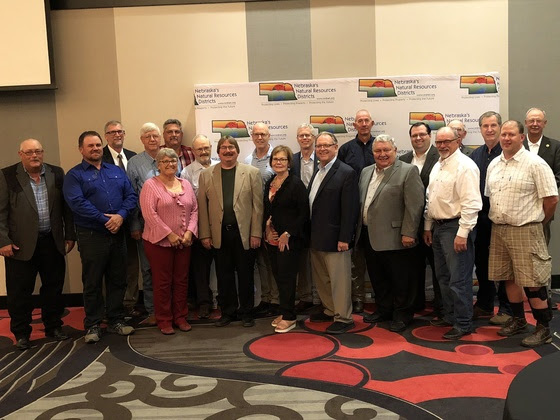 The three partnering groups celebrated this accomplishment while attending the Nebraska Association of Resources Districts’ (NARD) Annual Meeting in Kearney. Each entity signed a purchase agreement for the eventual transfer of the assets and water rights associated with the Spencer Hydro-electric Generating Facility near Spencer, Neb., from NPPD to the NRBA and NGPC, on or before Jan. 31, 2021, when all conditions of the purchase agreement are met. This agreement is part of a series of steps that started with a memorandum of understanding entered into by the parties in September 2015. “This signing today shows the Niobrara River Basin Alliance, four natural resources districts in the Alliance and our two partners working together to take proactive steps as we find ways to protect the river for generations to come,” said NARD President Larry Reynolds. The agreement will assist in providing protection for all users of the river including wildlife, recreation and agriculture. It will help keep water in the river for fish and wildlife, including endangered species, and will also protect recreation use such as canoeing, tubing and kayaking, along with irrigation for agricultural users. Several years before this historic partnership, the Niobrara River was the focus of studies and lawsuits. In 2015, the NGPC and NRBA joined together to work with NPPD and seek options for transferring the water rights from Spencer to the State and NRDs. In 2016, Legislative Bill (LB) 1038 was passed by the Nebraska Unicameral that allowed the entire water right to be transferred for basin management purposes while retaining the priority dates; an essential component needed to provide the protection to the river. With the legislation and purchase agreement completed, the NRBA and NGPC will work to secure funding to complete the $9 million purchase. NPPD established the original sale price of the facility at $12 million and is providing an in-kind contribution of $3 million. “NPPD is pleased to be a party to this agreement, which will provide water sustainability in the Niobrara River Valley and enable Nebraskans to continue to enjoy the river for fishing, wildlife, recreation and other uses in the future,” explained NPPD Corporate Environmental Manager Joe Citta, who was on-hand for the signing.